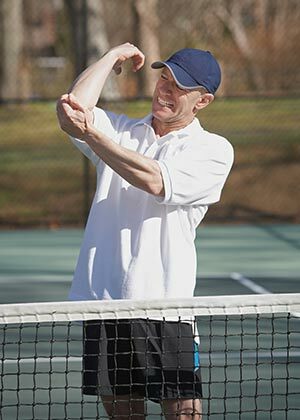 Despite their names, you don’t need to be playing tennis or golf to develop elbow pain. Their names are given due to the side of the elbow where the pain commonly occurs. Because of the nature of a tennis swing, if the elbow tendons or ligaments become inflamed, then the pain is on the outside of the elbow. As a golf swing is the opposite type of swing, their elbows get inflamed on the inside of the joint. Both types of elbow injuries can be quite debilitating, causing a complete loss of strength in grip of your hand. Often I see this condition come about from people who have repetitive strain type jobs. Carpenters, gardeners and manual labourers often develop both tennis and golfer’s elbow type pain. This is due to constant lifting and moving of heavy objects which puts too much strain on the elbow joint. This causes inflammation of the tendons and ligaments that attach at the elbow joint. The tendons or ligaments can develop small tears in them from overuse, which causes swelling and pain. The pain can vary from a burning sensation, to shooting pains down the forearm. Lifting up anything heavier than a coffee cups causes severe pain. This type of inflammation can take a long time to settle down on its own, if at all. Cortisone injections are the most common western medical treatment for elbow pain. Sometimes this provides long term relief, but I regularly see patients who only see short term gains. Cortisone is a steroid that has a strong effect on reducing inflammation, it needs to be injected quite accurately for it to be effective. Can Acupuncture Help Tennis and Golfer’s Elbow? I see elbow pain regularly in my clinic, both acute and chronic cases. Obviously the longer the joint has been inflamed, the harder it is to resolve. This is why I always teach my clients to come in for treatment as soon as possible. As stated above, elbow pain occurs from damage to the tendons/ligaments in the elbow. To much use and they can develop small tears, which cause swelling and pain. Aside from resting the elbow, Acupuncture is very good at relieving pain and I select points often along the forearm muscle and around the elbow joint to help relieve the pain. I also incorporate stretching exercises to help provide relief, as often this condition occurs due to overloading of the elbow joint. The muscles of the forearm should be sufficiently taking the workload, but if they overly tight or fatigued, their lack of flexibility transfers the load to the joint instead. As stated in the Acupuncture Evidence Report, there is what is classed as ‘medium quality’ data in scientific papers on Acupuncture and lateral elbow pain. Meaning that there are signs of a positive effect, but more research is needed to provide conclusive results. There has been little research performed on medial elbow pain as the condition isn’t as common.